The 2018 Errandonnee is underway and so am I. After cowering in fear of ice for a couple of days, I got my errandonee going with four errands in one day. I covered 34 1/2 miles in the process. 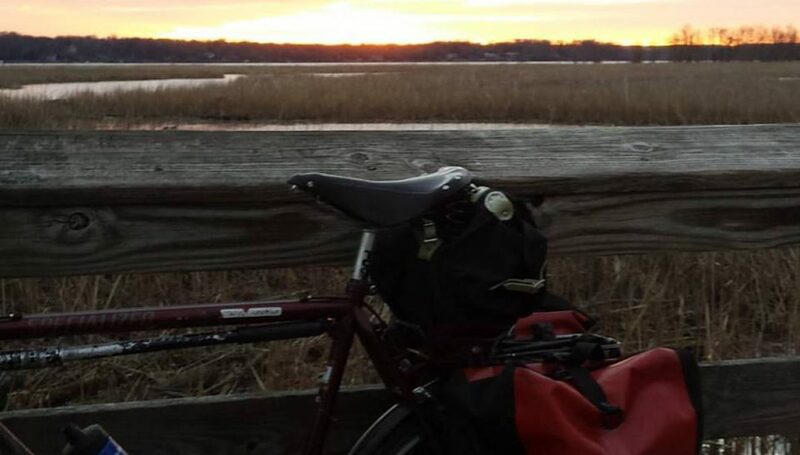 Observation: I got up and left the house well before dawn, took the inland route (which takes about 10 minutes longer than the Mount Vernon Trail) to avoid ice, and rode 15 miles into a cold headwind for hot coffee and a muffin. And friends. Totally worth it. Also, Ricky brought pound cake left over from his birthday. He is so old he wears a winter hat indoors. Observations: There was a 20 percent off sale and two of my three pairs of rain pants are kaput. So I bought a second pair of Showers Pass Elite pants. Love them. Also, the store is in the building that housed the first US Beatles concert. And to think I am just 54 years and a month late. Also, thanks to Jeff Wetzel for giving me directions from Friday Coffee Club to REI. He threw in a tail wind too. Observation: Last week, my physical therapist told me to lift less weight and to lift it sloooowly. It works better than lifting lots of weight and there’s less chance of getting hurt. Observation: This deli is about 1/2 mile from home. I could have eaten at home but their sandwiches are good and I get to support a local business. I had a Gary’s Lunchbox, chips, and a Diet Pepsi. Lunch of champions. As is usually the case, the Errandonnee comes at a time when my easy errands are hard to come by. I don’t work any more, I don’t have any physical therapy or doctor’s appointments, and I am probably skipping a volunteer opportunity this week so I can attend the Crystal City garage bike races. My planned adult activity today was to shovel snow. Mrs. RC did a round of shoveling while I was eating breakfast. The forecast called for snow all day so I was expecting to go outside and shovel in the late afternoon. I spent the early part of the day listening to a podcast, doing my back exercises, and watching a spring training baseball game. The anticipated snow never actually accumulated, because of warmer temperatures so I decided to ride my bike in the basement. I was about 50 minutes into my ride when I felt a wet sensation on my left ankle. I thought it was another random nerve pain from my blood thinners. Then I felt another sensation. I stopped and looked up. The basement ceiling (actually the kitchen subfloor) was dripping water. Our 21 year old dishwasher had sprung a leak. So I turned it off. I arrayed a bunch of pails and buckets under the drips and called a plumber. Two hours later the plumber called back and said that plumbers don’t do appliances, appliance repair people do. So I called the one he recommended and washed and dried the dishes in the dishwasher. I keep reminding my self that these latest irritating bits of life are pretty small potatoes. In the last 2 years I’ve been hit by an SUV, hauled off to the hospital in an ambulance at 3 a.m. with chest pains, nearly run over by a dump truck, and knocked down for a standing eight count with pulmonary embolisms and a collapsed lung. I’m a slacker compared to Mrs. Rootchopper. She was run over by an SUV and had salivary cancer, both in the last five or six years. Dishwashers and car windshield dings somehow don’t make the cut anymore as things to lose sleep over. So we’ll do the grown up thing and deal with them. Like adults.